Facts and information about the History of Clothing, headwear and regalia including Native American Turbans. Native American Indians are most closely associated with feathered headdresses and warbonnets, however, many famous tribes such as the Yuchi, Natchez, Seminole, Creek and Shawnee wore a cloth Turban. This style of headwear became popular during the 1800's as trade cloth became easily available. At this time tribes acquired many clothes of European manufacture. Symbolic plumes were added which stamped the culture and identity of Native Indians to the turbans. Prior to this time fur turbans were worn for practical reasons to keep out the cold by northern tribes such as the Mohawk, Chippewa and Pawnee. The history of traditional or ceremonial dress and regalia worn by Native American Indians is a fascinating subject. The following fact sheet contains interesting facts and information on Native American Turbans, a popular form of headwear or hats worn by many tribes. For additional facts about headwear refer to the articles on Roach Headdresses, Feather Headdresses, and War Bonnets. Native American Turbans Fact 2: The turban is most associated with countries of the Far East but Turban wearers extended North Africa, the Middle East and Asian countries. 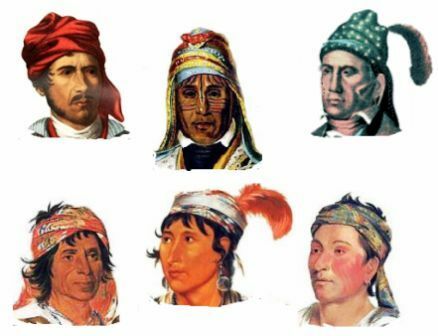 Native American Turbans Fact 10: The Southeastern tribes who wore a turban included men of the Five Civilised Tribes, notably the Cherokee, Creek and Seminoles, and other southeastern tribes such as the Yuchi and the Natchez. Indian Turbans Fact 18: A Cloth turban was also created resembling a type of bandana.